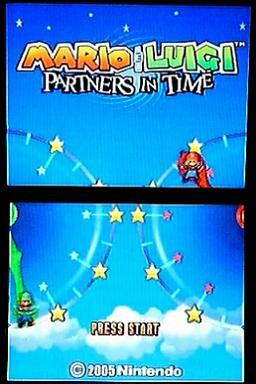 Released in November 2005, Mario & Luigi: Partners in Time is the sequel to the successful Mario & Luigi: Superstar Saga. Not satisfied with poltergeists, Professor E. Gadd has created a time machine. The first trial is (of course) made by none other than the Princess. She is predictably captured, and Mario and Luigi must team up with their baby selves to repair the time machine, put Baby Bowser to nap, and rescue the princess from an alien race called the Shroobs. Best time: 4:07 by Alex 'Anwonu' Morinaga on 2011-07-23, done in 46 segments. First of all, thanks to everyone who works hard to maintain this site. This might sound superficial, but I'm really grateful for all of them. Also, thanks to everyone who helped doing this run. I won't name everyone, since I can forget someone and hurt their feelings =p; but special thanks to Kyanrute, who gave an initial idea of a time, and helped on the first run. The bonus points always goes in POW, except in Yoob's Belly, where I invest in Speed. This is to be able to attack Sunnycide more often when he's down. Manipulating the points is easy; different than the first game, the roulette stops instantly, which helps a lot. After a few times choosing the same stat, it starts to list only 1s and 2s. Not only that, but some 2 "transform" into 1, which makes harder to get it. I'm not sure if there's some way to make them not "transform". Toad Town, to buy Risk Badges, the best badge to do damage (the less mushrooms I have, the greater the damage I do). Before Thwomp Volcano: a Copy Flower, so I can defeat Mrs. Thwomp faster. Main strategy for most bosses: lower defense with Ice Flower, use a Red Pepper, and attack. Swiggler: Sincerely, it's been so much time since I fought it, that I don't remember the details. But IIRC, if there were 2 gray shrooms, I'd use Bro Flower; if there was only 1, I'd risk Bro Flower again, unless if it was late in the fight; and if none, use Cannonballer. If the cursor points to A, the real one is B. If the cursor points to B, the real one is C.
If the cursor points to C, the real one is A. If the cursor points to D, the real one is E.
If the cursor points to E, the real one is D.
It's different for Luigi, but I don't remember how now. Sunnycide: I need some luck here. The Ice Flower must lower both his defense and speed, so I can attack more when he's down. Also, IIRC, Mario must be the one to break the last egg; that gives one extra turn to Luigi. Shrooboid Brat: this is where I started to love Pocket Chomps, though I almost didn't use them. Petey Piranha: Not much to say. Mrs. Thwomp: Probably the easiest boss when you have the right things. Bowser and Bowser Jr.: Not much to say. Commander Shroob: Luck again. I could use Copy Flowers and ensure that the Shroob-Omb always go right, but it's a bit slower than using a Red Shell. Elder Shrooboid: I remember this being a pain in my first run. I guess I had some luck this time, though I couldn't finish its second form with 1 Copy Flower only. Princesses: Pocket Chomps weren't very good. At least not as good as I wished. In a previous attempt, I could do 2000 with one. Yoshi's Island, when you need to extinguish the fires; there's a very small space that you can land without being hit by the fire. There's another trick that I couldn't do; here's a video. In Star Shrine, where you need to pass through a little maze with the babies. Instead of the normal way, I send them flying there. A bit faster than the normal way, I believe. Big skip: in Shroob's Castle, after entering the room with a blue pipe in the middle. You need to be almost as far as you can to the left (maybe right too), and then fly. I loved it when I discovered this; that means no Cellar, and a few minutes less. 28-30 Thwomp Caverns, Bowser and Bowser Jr. There are some differences between the US version and the Japan/Europe versions; for more info, check this site.